Thanks to a prolonged, romantic affair in Ramsgate, his great grandfather, notorious womaniser and bon vivant, Guibert Benfutuis de Beaupoil, pleasantly passed his sojourn long enough in England to avoid the horrors of the French Revolution. As a result his descendant the Compte Archibald Groslard de Beaupoil had the good fortune to live in the grand yet austere Chateau de Beaupoil with its acres of splendid French forest, fertile farm land and vast vignoble. As a rich landowner of allegedly noble blood, Seigneur of the Comté with several tenants each with modest parcels of his land, the Comte had weighty responsibility, and he wielded impressive authority. He attended Church service each Sunday morning. This was to make sure that his servile curate continued to instil the fear of hell into the hearts of his farm labourers regarding the evil of not giving one's utmost effort, or final breath for the noble cause of the Comte. Archibald was certain that his social duties gave the community a sense of duty, security, responsibility and identity. And his rigorous demands guarantied their loyalty. The curate humbly received his meagre donations and guided the local community fittingly, likening the Comte to one's gilded shepherd, etc. Thus the standing of Archibald was religiously maintained. In order to try to satisfy their Seigneur and scratch together enough to able to pay the biannual rent, the tenants were always obliged to get the best possible results. Each Christmas the Comte Archibald would condescendingly make a show of his appreciation for their efforts by giving them very small tokens of gratitude, as well as little extras for the most hard working labourers, or for the families of those who through utter exhaustion had made the ultimate, noble sacrifice. When the years were particularly good, he would even make personal visits to each tenant and allow them to kiss his hand. This was considered, mostly by the Comte, a great honour indeed. But on average years he would have his small tokens and little extras sent by one of his valets. There was one person living in the most beautiful part of Comte Archibald Groslard de Beaupoil's forest who never paid any rent at all. He was perfectly independent. So much so that for quite some time, no one was aware that he even existed. He was an old vagabond who had travelled far and had seen many wonders of the world. After much wandering he had chosen to return to live the last period of his life peacefully in the forests he remembered and grew up with as a boy, so many years before. He had no need of money. The forest provided him with everything he needed. The experience of his travels had made him wise and resourceful, and thanks to the gifts of nature and the bare necessities he always carried with him, he lived as freely as he wished. There was a pristine trout stream, and plenty of game for his clothing and his meals. There were fruits, berries, hazel, beech and chestnuts. He knew which herbs to take whenever he needed them for his health. He knew how to make a fire for cooking, and to keep himself warm in the winter. He lived quite comfortably sheltered in the dry, mossy hollow of a great oak tree, entertained by the delicate music of the birds. He was perfectly content. Comte Archibald Groslard de Beaupoil was not a gifted man. His requirements were met by his servants and tenants. Whatever he needed would be brought to him. He had no inclination to leave his chateau unless he had a financial reason for doing so. He would spend much of his time nursing his gout in front of a modest fire in one of the smallest of his chambers, drinking red wine whilst going through his accounts. There was a pre-gout period when he would go out, though never very far, with a dog, a shotgun and the intention to kill something. But he could never possibly have been considered a chasseur, even by the worst French standards. Although once, miraculously, he managed to bring down what must have been a totally disorientated woodcock. The poor bird was so pulverised and peppered with shot that it was neither edible nor stuffable. He flung what was left of his trophy on the kitchen table and ordered the cook to prepare it for his dinner. To avoid yet another tantrum, she prepared a pigeon instead, perfectly confident that he would never know the difference, which was indeed the case. During the vagabond's second winter in the forest, Mr. Furet de Trémouilles, an ambitious gamekeeper who pretended to be of noble stock, reported to Comte Archibald that he believed there was a trespasser in the forest. Naturally the landowner was appalled by this news. So shocked was he that further concentration on important financial matters was out of the question. He immediately ordered that the trespasser be captured alive and brought before him. All the gamekeepers were summoned to rout out the culprit, to be arrested on charges of trespassing, poaching and wilful destruction of private property, all still punishable by death according to the law of the Comté. Archibald Groslard was determined that an example must be made without delay. His keepers and wardens, armed with shotguns, old muskets and even ancient blunderbusses, were far too clumsy and noisy however. The wily old wanderer was sadly amused by their vain attempts to capture him. He easily outwitted them, and even their hounds, on every attempt. Their efforts became more and more desperate as Comte Archibald was losing patience and complete track of his financial affairs. Each time they returned after yet another unsuccessful day they were terrified to face him. Archibald, so infuriated that his blood pressure was causing havoc, threatened them all with severe punishment if, after one more week they failed to capture the cursed churl. The wardens and keepers knew what this would mean. They tried everything within their limited capacities to catch the old fox, but all to no avail. On the sixth day they were so terrified of the consequences that they all fled. Only a few hounds sullenly returned to the chateau, their tails low between their legs. The landowner had become totally obsessed by the affair, shunning all of his financial, seigneurial and ecclesiastical duties. There was a general feeling of unrest in the community. The Comte issued a proclamation underlining the existence of a destructive, dangerous, thief and trespasser in the heart of his forest, with a promise of some sort of reward for his capture. The attempts of the tenants and labourers were even worse than the former efforts of the keepers and wardens. Sometimes the bearded old vagabond, felt more pity than amusement. 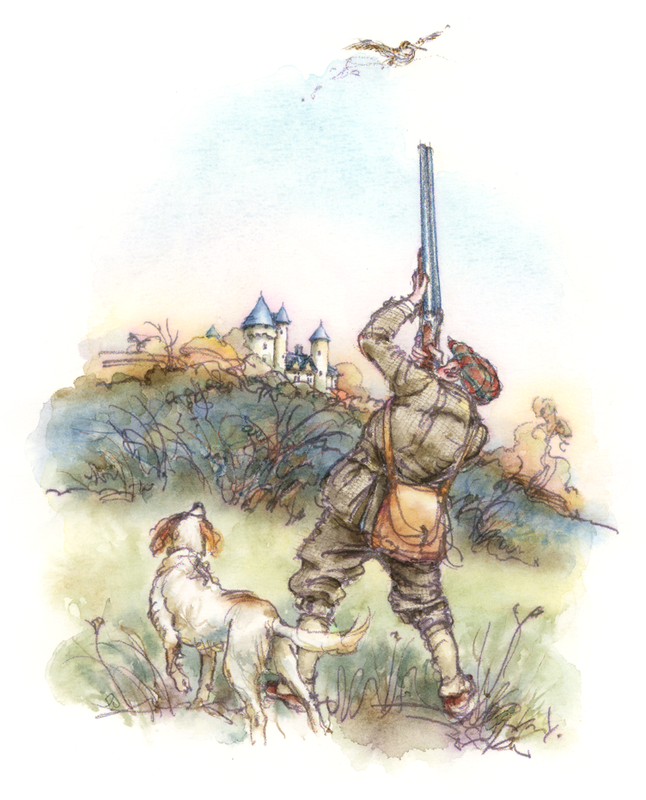 Then he would leave a snared rabbit or a pheasant where he knew they would find it. But although they were sorely tempted, and pretended not to understand, they were too terrified of the Comte to risk taking his game. They also had their farm work to get on with. The clearing, ploughing, pruning and spring planting were already overdue. They had no time to chase ghosts. Clearly for the Comte, there was no other option or consideration. He was by this time so wildly possessed by the problem that repose was impossible. The nights brought little relief. He tossed, turned and sputtered like a huge ham on a spit, and his big four poster bed creaked like an old, doomed galleon in a storm. Finally Archibald decreed in another public proclamation that the whole community must devote their time in extirpating the evil criminal. No matter how urgent their work, they must give absolute priority to hunting down the cursed cause of Archibald's torment. If they refused to do so, they would be punished, and where applicable, tenancies would be revoked also in keeping with the law of the Comté. There would be a handsome reward for whoever brought the foul fiend to him personally, dead or alive, but the amount wasn't specified. The large scale hunt was disorganised. It caused chaos, more torment and eventually great sadness. The community was mostly made up of simple, rural folk. Their farming talents could have been put to far better use, especially at such a time. To make things worse there was a terrible pitchfork misadventure. A young boy was mortally wounded. After the tragic accident a bitterness arose amongst the people. The Comte made it known that there would be a special Church service to take place the following Sunday morning at 11 o'clock. It was supposed to commemorate the sad loss of the young lad, but on the day, Archibald gestured to the curate that he intended to speak first, and he painfully limped up to the pulpit. He wore his dark, velvet suit for serious occasions. He looked unwell, curiously dishevelled, and dreadfully grim as he spoke. 'The Lord God, as well as myself, nevertheless thank you all for your ineffective, futile efforts in trying to bring to justice the despicable evil now responsible for the death of one of our children, an innocent lamb of the Comté and almighty God. This brief, dramatic oration caused a great deal of murmuring in the congregation. Everyone was very impressed, but no one fully grasped what the Comte finally meant. Comte Archibald Groslard de Beaupoil had decided to systematically burn down every acre of his forest land during the late spring and summer months of that year, in order to smoke out and put an end once and for all, to this 'devil's fiend that lurks their mocking me still.' The community were to carry this out. It was the month of May. Bluebells and primroses shimmered beneath the old, noble beeches, and the warm sun rays lit their new leaves and warmed the soft, brown earth in the clearings. It was a peaceful day, especially chosen, for the old vagabond was tired. Not from the lame, absurd efforts of others. He had simply decided that the time had come to finally rest. He knew where he was going. He always knew. He was so grateful for the gift of life, and was quite ready and willing to return it. He accepted this as perfectly natural and essential. To him all was beautiful. He made his own preparations. He had no need of mourners or tomb stones. Nothing was better than the whispering of leaves in the breeze, and the gentle melody of the birds to his ears. Life would go on, which made it right, and therefore all the more beautiful. The fires began at the end of that month and lasted until early September. Systematically, acre by acre, the forests were destroyed. The chateau in its parched surroundings looked incongruous, like a sad scar. Often beyond all control, the fires had also reduced to ashes the few crops that some tenants had managed to cultivate, as well as the vineyard. For want of food most of the community were forced to leave. The church was plundered. And the Comte Archibald Groslard de Beaupoil was by that time constantly in an addled, drunken state. Eventually he was found lifeless, sprawled over his counting table. The wine spilt from his broken glass had stained the wooden surface like dried blood. All his money, heirlooms and objects of value had gone, taken from the chateau without the slightest qualm, mostly by those he had employed. The curate had come too late. But not even he mourned the death of the landowner. The old chateau gradually fell to ruin. It was thought to be cursed. Yet the fallen grey stones were covered with lichen and bright green moss. Periwinkle wended its way between them colouring the shadows. Wildlife began to flourish once more. During an autumn season Virginia creeper gloriously coloured the few remaining walls of the old ruin, in resplendent harmony with the bright gold of the leaves of the surrounding beeches. For the forest had grown back again, as majestic and as beautiful as ever, fabulously blest with eternal magic, the spirit of the wise, old vagabond.